Its time to say Good Bye to the free INTERNET we know, where your packet is never discriminated based on what it contains, where it is coming from and where it is going. Senate Commerce Committee, rejected the compromise language on Net Neutrality by splitting11-11, which wouldÂ mean a defeat for Net Neutrality. So very soon carriers will be empowered to inspect the packet and charge a premium not only based on the content, but possibly where it is coming from and where it is going. or a Tiered internet based purely on content type, means carriers will now offer a package Internet connection deal which literally says basic internet connection is $14.99 with which you can access emails and visit a few allowed websites, with optional adds ons : music internet $4.99 (you can listen and download MP3s), Video internet $4.99 (you can watch and download videos) and the list goes on. Having a package like cable television will not be a big surprise even.Â America Top 60 for $15.99, which allows you to access top 60 websites mostly news and general. America Video Classics, $11.99 which allows you to watch and download videos from any video website. America top 100 Music, that allows to listen and download music from 100 listed websites. In a variation, carriers may set Band Width limitations where if you visit carrier owned music site, you will have unlimited Bandwidth while if you visit a site like Youtube or Flickr, every byte is counted towards the bandwidth limit and the consumer will have to pay premium charge for the additional bandwidth if he chooses to use.Â Or something very creative and unbelievable package deal, but you have pay like $140 to goto any website you like. We just have to watch and see how creative these Telcos can go. This is particularly interesting keeping in view the fact that most Telcos have been threatened by internet innovation and have been lossing business starting from IM to Skype phones. Recent hurried consolidiations is nothing but an indication that they can not compete for the same already cutdown pie and possibly survive longer. So, now its time for them to take a revenge and show internet companies what it feels like to be threatened. Time again to put some bucks on these telcos, after a long long time. During the christmas, be ready to hear the analysts, confirming "Christmas sales revenue is down 5% from last year owing to increase in internet access fees". Another cool feature from snapfish. Now you can turn your photos to US Postal stamps. One key excerpt from his presentation is how Indian IT industry transformed over the last decade to differentiate with Innovation rather than pure cost advantage. The world is recognising India as its key INNOVATION center with a wealth of skilled and knowledge professionals rather than just a low cost IT production center or outsourcing partners. This is very important differentiator for India, particularly interesting in the wake of the new low-cost-IT facilities being opened in the rest of the world. If you see the number of employees in India-owned IT Companies and other multinationals like IBM, INTEL, MICROSOFT, the difference is quite striking and convincing the argument. 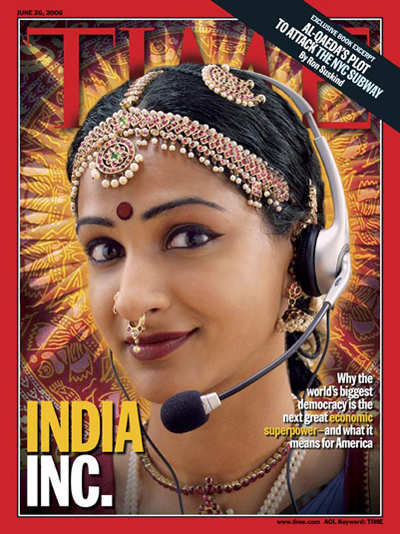 As per estimates in year 2005, MNCs employ more Indian professionals than Indian companies. Indian IT is no longer confined to just the top 5-10 companies which are known more for evangelising the outsourcing, professionals-on-hire, labs-on-hire concepts. As per NASSCOM estimates, there are about 3000 Indian companies/startups who are differentiating India as a key Innovation hub, have revenues less than $25Million, hinting the surge of Entrepreneurial ventures by ambitious Indian professionals and business people alike. The presentation also highlights a few interesting facts about Indian Auto industry and how software/IT advantage can bring innovation and capture one of the largest markets. Very interesting and striking features of Indian Auto industry have been presented; the gap between a motor cycle that costs around $1000 and a car that costs about $6000. A $3000 car is going to be a killer for India. And the same or similar car that costs $6000 in IndiaÂ costs around $20000 in US. Can this huge cost barrier turn American Auto to look for innovation and electronic and embedded component manufacturing in India? Big question but a definite opportunity. It is pretty clear that Software or IT industry not only brought so much vibrancy in the Indian markets and fuelling aspirations of Indian middle class, it has also changed and can impact literally every aspect of common Indian life. The Telephia Mobile Game Report for Q1 2006 has some startling figures about mobile gaming.Â As perÂ news report at Yahoo, whichÂ is aÂ Press Release by Telephia, Women dominate the mobile gaming arena accounting for 65% of the revenues while Tetris and Tetris Deluxe combined accounts for around 8.8% of the revenues. Read the press release here. India's Bharti Airtel figures at number 10 in the Business Week's world top Infotech/Telecom comapanies list, ahead of international power houses Motorola (11th), Google (13th), Microsoft (37th) and Hewlett-Packard (44th). Bharti Airtel, Tata Consultancy Services (TCS), Infosys, Satyam, and Wipro figure in the annual BusinessWeek list of top 100 infotech/telecom companies. India ties Hong Kong in fourth spot with five companies in the top 100, after the US with 45, Taiwan (13), and Japan (9). As against this, thereâ€™s no company from mainland China. Bharti Airtel is the only Indian company in the top 10, ahead of international biggies such as Motorola (11th), Google (13th), Microsoft (37th) and Hewlett-Packard (44th). The factors that BusinessWeek focused on to rate the companies included return on equity, revenue growth, shareholder return, and total revenues. "If I have seen further it is by standing on ye shoulders of Giants" - Sir Issac Newton We learn lots of things from our own mistakes. But a few of us also learn from others' mistakes. Some times, we can succeed just by following in the footsteps of successful and ambitious entrepreneurs. So, then a much better path to succeed is studying about successful people and their ventures. On this note,Â I found a few blogs this morning that I would like to share. Talking about failures at Feld Thoughts, urging Entrepreneurs to share their failures. So keep watching this blog for more posts on this subjects and its readers' responses..
"While itâ€™s often difficult to talk about failure, there are a lot of lessons that can be learned from it.Â The cliche â€œI learn more from my failures than my successesâ€ applies directly to entrepreneurship and creating companies.Â It can be difficult to be self-reflective, but Iâ€™ve personally found it very cathartic to study my failures, understand what I did wrong, learn as much as I can from them, and move on.Â Occasionally Iâ€™ll have a similar failure a second time or a third time â€“ hopefully I learn eventually." While reading Feld Thoughts blogs, I found a comment by Mark Crowne pointing to a paper he wrote on "Why software product startups fail and what to do about it -Â Evolution of software product development in startup companies", discusses specifically about Software Startup failures and what to learn from them. Also, there are two posts by Pamela Slim from Escape From Cubicle Nation that summarizes her decade long experience in starting and growing her business, offers what a budding entrepreneur is looking for. What she did right and what she could have done better. Here are links to those two posts; Thanks a ton, Pamela Slim. Dr. Seuss aside, what I did RIGHT when starting my business - in which she discussed 10 things that she did right from the beginning. Videos from Software 2006: Unifying the Ecosystem held on 4th and 5th of April 2006 at Santa Clara Convention Center Santa Clara, CA. Most of the speakers from big enterprises or from top 10 consulting firms. Different voice, slightly from the big vendors, compared to what I hear from the new age web2.0 entrepreneurs. But great insights for Software startups, as these are the guys who were in the business for more than a decade building and selling software. Here is a loooong list of Web 2.0 companies. Who says every product will and must try to solve a unique problem in the market?Â Most of these are plain vanilla duplicates of others or something popular. But some of them are wonderful like Thumbstack which allows to create and share presentations right from your browser. Sony follows the online video buzz, offering its online Video service "MusicBox". Offers original video streams of artists by its own companies and affiliates like Shakira, Beyonce, Alicia Keys and likes. Pretty soon, the service allows you to embed those original video streams on your webpages. At this point, you can watch the videos and can send an email with the link to the video to share with your friends. Unlike some of my friends, I don't have a choiceÂ of not going. Ruled out. So here I am, trying to equip myself with some things I can do when shopping turns painful and boring. I love reading books. So I pickup the Mall directory and find a bookshop and in a flash I will be sitting in aisles reading like a kid. I tried skimming through magazinesÂ even in Walmarts these days. If I get hold of an interesting book or a magazine, I never have to worry about for the entire day. I look for variety outlets in the malls and go and explore. Even in the most stereo type malls there will be some thing novel. I found that exploring some crazy shops is so much refreshing. I like watching how people sell things in the small outlets. Last time I watched almost for an hour how a Verizon sales rep was selling mobile phones. He was very good. He sold 3 mobile phones and medium rate plans but with all expensive accessories that I can think of. I found out that they earn more commission on accessories than mobile phones. I some times just watch how people are making buying decisions. I read so much about impulses. But watching those impulses in action is a wonderful experience. When I don't feel like doing any of them, I pick out my iPod and then just relax listening to music. Immigration Reform bill will most unlikely becomes a law, if at all, this year. Not a welcome news. 06.21.2006 2:12 PM EDT Surprise move brings debate to U.S. voters, derails Bush plan. ".. On Tuesday, Republicans announced a proposal to take the issue directly to voters by hosting a series of hearings across the U.S. this summer, a ploy that will likely delay any action on immigration reform until after the upcoming mid-term elections in November, and perhaps until next year. Last December, the House passed an immigration reform bill that was more law-and-order focused than the competing Senate one, which was passed in May â€” including the aforementioned felony provision and a call for hundreds more miles of border fencing than the Senate plan (see "Senate Passes Sweeping Immigration-Reform Package"). The details of the July/August immigration road show are still being worked out, but New York Representative Peter King said leaders plan to take them to "the places where we can get the best input," according to a Reuters report. The hearings are expected to look at the Senate bill and gauge public opinion on the issue of immigration. But it was also clear that House Republicans hope to use the meetings to try to expose what they see as the weak points of the Senate bill and stoke public opposition to that approach â€” which would implement a guest-worker program that could lead to legal residency â€” according to The New York Times. Democrats in the Senate said the unusual call for hearings on already-passed legislation is a blatant delay tactic meant to push compromise negotiations back until after the November congressional elections. "It is now becoming clear congressional Republicans are doing their best to make this a major issue in the campaign," said Democratic Senator Richard Durbin of Illinois. ..."
As promised in my previous post How to start a Business in India, I would like to share the links to websites and resources that would not only help to understand the attractive Indian Business Environment, opportunities and resources but also would help you start a business in India. Know India at National Portal of India : "The ancient land of India portrays a landscape of vibrant cultural heritage and spiritual mysticism. This particular section invites you to lose yourself in a journey through the fascinating lanes of the country, which reflect its numerous national traits, such as art, national identity elements, cultural extravaganza, and so on. Living up to its name, this section houses information on all the elements that go on to shape this splendid nation called India, and is an enlightenment zone for anyone who wants to know all about this spiritual country". Also read about key sectors of Indian Economy. Doing Business in India, an Ernst & Young publication presents an overview of the countryâ€™s investment climate, taxation, business and accounting practices, as well as Indian society and culture. - A must read to have a big picture of Indian business environment. This publication has also contact information about major bodies/committees/associations related commerce in India. There are so many web pages that lists out various business entities possible in India. The resources mentioned above in the first section also have list of entities available in India. Here are some of the links that have better clarity. Some of these links have mostly similar information, but on reading them I found each link covers slightly different area or little additional information that is not available on other websites, so try to have a look at all of them. Business In India (NASSCOM) : NASSCOM ( National Association of Software and Service Companies) discusses about various aspects of doing business in India, particularly IT business. It has a seperate section devoted to "Setting Up An IT Company". By far, this page is the most detailed for setting up an IT business in India. This web page also discusses about various India Government incentives for IT businesses, IT parks, special economic zones etc. Doing Business in India, a web page compiled by Indian Embassy and has important links included along with description about various business entities in India. Not all Business entities need formal registartion in India like Sole Proprietorship, General Partnership and Cooperatives. Again, multiple websites list a similar procedures, but I have included only those web pages that have some useful information. Guidelines for applying for a company at Ministry of Companies Affairs This link has clear guidelines about various forms that need to be filled in and various fees invovled. The following websites explains why India is such a wonderful market to start your business in. They also connect you to day-to-day financial news about India and the emerging market. Portal of India and the best and most comprehensive website with lots of information and almost exhaustive links about India, its people, its economy and business. Calls made on Skype in Q1 of 2006 account for around 7% (6.9 Billion minutes) of all long distance call minutes world wide. eBay accounts for 14% of all e-commerce on the net with a gross merchandise value of $44 Billion in the last year. Skype supports around 6.5 Million concurrent users. Merit can be bought. Passion canâ€™t. As a followup on my previous post "Passionate vs Professional Programmer", here is an Excerpt from How To Be CREATIVE by Hugh MacLeod ( http://www.gapingvoid.com) that put the discussion in context. I totally agree that Merit can be bought but not passion. The only people who can change the world are people who want to. And not everybody does. Human beings have this thing I call the â€œPissed Off Gene.â€ ItÊ¼s that bit of our psyche that makes us utterly dissatisfied with our lot, no matter how kindly fortune smiles upon us. ItÊ¼s this same Pissed Off Gene that makes us want to create anything in the first placeâ€”drawings, violin sonatas, meat packing companies, websites. This same gene drove us to discover how to make a fire, the wheel, the bow and arrow, indoor plumbing, the personal computer, the list is endless. Part of understanding the creative urge is understanding that itÊ¼s primal. Wanting to change the world is not a noble calling; itÊ¼s a primal calling. We think weÊ¼re â€œproviding a superior integrated logistic systemâ€ or â€œhelping America to really taste freshness.â€ In fact weÊ¼re just pissed off and want to get the hell out of the cave and kill the woolly mammoth. Your business either lets you go hunt the woolly mammoth or it doesnÊ¼t. Of course, like so many white-collar jobs these days, you might very well be offered a ton of money to sit in the corner-office cave and pretend that youÊ¼re hunting. That is sad. WhatÊ¼s even sadder is if you agree to take the money. I have been in the software development for almost 7 years now. It has been a wonderful journey throughout in various roles, titles, responsibilities, applications, frameworks, domains, operating systems and hanging around different types of people. So far, I had the opportunity to hangaround and work with people from US, China, Japan, Ireland, Brazil, Russia, France, Thailand, Vietnam and ofcourse from India. Some of these people across the world have one thing in common; their passion for software development. That is taken for granted irrespective of thier domain, platform or programming language(:-)) they like. I also had the company of a lot more people who just consider their job nothing but just as a means to lead a better life. They are also experts in their own fields, but they don't like a lot what they are doing. If there is another profession that has better prospects, they will definitely choose to move on unlike a few of them who love so much about software development and dream nothing but a world of software development. I call the first set of people Passionate programmers and call the later as Professional programmers.There is nothing wrong with any of them. I am just attempting to illustrate the differences and how they impact the organization. When some of the characteristics resonate with your traits and how you do your job, you know who you are. I found that Passionate people dig really deep to understand the real problem and come up with solutions. They create solutions that are simple and clean. They like what they are doing and they typically spend more time than any body can think of or a typical managers budget for. They speak with enthusiam about their work. Their solutions mostly will be very few and specific in nature. Their ideas are often resisted by people around. But they will have a major impact. They also identify current problems and solve them, even before they are posed as problems, proactively act on things. They oftenÂ hate to spend time in non-tirivial things and make life simpler by creating lots of utilities. Many tools and enterprise software is often result of these small toolset. But typical Professionals understand the issue on the face value and give generic solutions that look so good on the paper(but most often they don't work in real life scenarios). They useÂ lots of and allÂ kinds of fancy tools. They use a lot of jargon. They often quote nice-looking-ideas from text books/websites and they also lead by quantity rather than quality. Their solutions are generic in nature so also get greater acceptance from others(who are also typical professionals).But most of them have very low or no impact. Unfortunately, it is not easy to seperate permanently, passionate from professional programmers. Partly due to, people some times become passionate about a project and some times act professional as they don't like what they are doing. "You are not paid to do your best. You are paid to win the case." - The Verdict (movie). To say the key difference in few words, keeping all things equal like expertise, Passionate put thier heart in while professionals don't. That makes a huge difference in what they can do. Its not confined to software development. It is true in any walk of life.Â I read so many blogsÂ recently, and found out the same. There are passionate bloggers. And there are fancy, professional and paidÂ bloggers.Â Some of them have deeper understanding about what they are writing. Some just write because it is justÂ the most talked about thing and would bringÂ in more page hits.Â Most of the blogs provide 'advise', on things that they never experienced, leave alone mastered. Very few talk about their real world experiences with enthusiasm and notion of sharing with others, instead of 'advising' others to follow a nice looking path that they never knew existed. Well that is all part of the blogosphere. Nokia has announced that it will shift its global telecom network management services hub from its home-base in Finland, to India. Speaking at the occasion, Rajeev Suri, senior vice president, Nokia Asia Pacific (Networks), said that the managed services will be led globally out of India from July this year, and that Ashish Chowdhary, presently Head of Networks in India, will escalate to Global Head of Managed Services from India by the end of 2006. Suri said a central role was envisaged for India, wherein the country will not only function as a large target market but also as a hub for delivery and direction. It is Nokia's Managed Services Division that runs telecom networks of service providers as part of the outsourcing agreement, and the current Vice President of Managed Services, Henrik Sund, is reportedly quitting the company. Suri added that Nokia's first Global Network Solutions Centre situated in Chennai had begun operations in May, and that it would serve as a hub for Nokia Operations Centers across-the-globe. In a separate announcement, Nokia and Siemens declared their intention to merge Nokia's Networks Business Group with Siemens' carrier-related operations to form a new company, named Nokia Siemens Networks. The resultant company will be a 50-50 joint venture, and will hold the promise to become a global leader in terms of growth segments in fixed and mobile network infrastructure and services. I have been searching for a while for resources and trying to contact consultants to help starting a business in India. At first I found only few links which talk about this topic and explain various options available and what needs to get started. And these links only talk in very brief and summarized format just to give an overall idea but not give enough information to decide any thing for example the form of organization. And there are one or two links that gives a hint about the steps involved in starting a business. Having little knowledge and details, I was desperate to find a consultant who can handle this for me. I did not succeed even in that almost for 3 weeks now. But I am very happy and thrilled today for I found some links and websites which not only have thorough information about many aspects of starting a business in India, but also there are portals which allows an entrepreneur to take care of most of the steps in starting a business online. That is true, most of the stuff can be done online. I was suprised first and then amazed to see that there is a portal for everything.Â I have jotted down lots of notes and stored many of clips using Google Notes. I will organize all my notes and share it on my blog here in the next few days. If you are looking for any information regarding starting your business in India, please bear with me and Please visit towards the end of the week. I will have all the compiled information on this blog by end of this week. Update on 21st June, 2006: I haveÂ compiled variousÂ Links on How to start a business in India and posted here. Can I see or detect if my internet traffic is differentiated? Answer to that question is, I don't think so. There is so much technical complexity involved, that except few geeksÂ who work right on computer networks, not many people can detect if their Internet traffic is ever discriminated.Â That is one of the reasons, I guess,Â why we need Net Neutrality as a law, so that the Telcos will never try to discriminate your traffic, though you are not quite aware of. There is a post at Save The Internet, that alleges Cox Communications of blocking Craigslist for almost three months. The security company Authentium, who handles security for Cox Communications reportedly explained with technical details why users can not reach Craigslist website. It looks like there is problem with the computers that hosts the craigslist website. Here is the reply from rnapier, strongly suggesting that the behaviour is normal and as per the specification. . Note the final â€œwin 0â€³ that confirms exactly the problem that Authentium claims. Summary: craigslist told Cox to please speak to it very slowly. Cox did, but for longer than craigslist explicitly requested. Fixing this for craigslist could break other sites, so some caution in shipping a fix is justified. The fact that SaveTheInternet posted this as an â€œopaqueâ€ response without further comment raises a question of how much STI actually knows about how the Intenet works. Update: Richard Bennet's blog posting "Know-nothing claims about site blocking" has lot more information and discussion about this issue. And also Richard Bennet and PBCLiberal commented on this blog that it is possible to detect if internet traffic is differentiated using existing tools, if you understand the internet protocols. For those of us who do not understand, we have to wait for somebody to write a simple tool to hint if there is any unusualÂ stuff detected.Â See comments for more. Further fueling the consolidation in the telecommunications equipment and technology market, two giants in the business are merging their respective telecom gear businesses â€” Nokia and Siemens will merge into a single company, according to the Wall Street Journal. In a deal valued at â‚¬25 billion ($31.5 billion), Finnish Nokia and German Siemens will combine their telecommunications businesses in a new company to be headquartered in Finland and run by Nokiaâ€™s executive Simon Beresford-Wylie. There are so many features that we might not have used in Microsoft word that are so useful and handy. For example you can dictate your blog posts using the dictation feature in Microsoft word. This blog posting has been dictated using Microsoft word dictation feature, completely. I added only commas and divided into paragraph.Â Itâ€™s sometimes difficult to get everything correct first time, thanks to my Indian accent but itâ€™s not a big deal. I guess it takes time to train it. Moreover, once we have the basic text ready, it is easy to edit the text, than typing all text ourselves. I canâ€™t believe itâ€™s a lot of fun to play with it. It did not understand blog, I had to train it first. If you never tried the dictation feature, try it out. It took almost 6 minutes to dictate this post. You might enjoy it.Â Not just that,Â you can also relieve your fingers. Go to tools menu and click on speech. The speech toolbar will appear on the right hand top corner. Click on Dictation to start. You can also use voice commands while using word even though you are not using dictation. It is so cool and easy to use. Maybe I can do more accent training so that it gets used to my accent.Â Pretty soon I can completely use word to type my blog posts. I have to use keyboard and mouse all the time in my office. At least when I am blogging or using computer at home I can use Microsoft speech recognition software, to give rest to my fingers a little if not completely save myself from CTS(Carpal Tunnel Syndrome). Microsoft Chairman Bill Gates announced (Announcement Video) on Friday that he will be working part time at Microsoft and full time at Bill & Melinda Gates Foundation by July 2008. 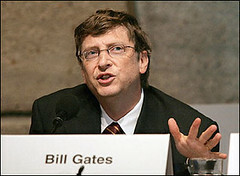 However Bill Gates insisted that "he is not leaving Microsoft" and will continue to serve as Chairman even after July, 2008. It has been a phenonenal and legendary journey for Microsoft and Bill Gates. 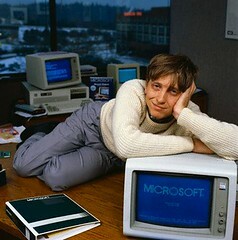 If it is not for Bill Gates and his Microsoft,Â not many of us wouldn't have seen PC by this time. Despite the evolution of technology and greate entrepreneurs and competitors, still more than 90% of the desktops are powered by Microsoft Windows Operating system, a greatest of all feats, in a sense a miracle that only Microsoft could achieve in this cut throat competition era. The Microsoft and the world of technology and business will miss a great and unparalleled visionary, but for a much greater and noble reason. With full time contributions from Bill Gates, the foundation now could expand its helping hand to more countries and give life to a lot more people. Bravo Bill Gates.You may be missed a little in the developing countries, but your presence will be now felt in the hearts of lot more people than you have won with your Windows. I read it as "Bill Gates is stepping away from windows to open doors of his heart to the world". For those of you who could not attend to the TiECON East being held in Boston today and tomorrow (16th and 17th June, 2006), you may be missing the live action. But notÂ spirit of TieCON, its key messages and all the information. Podcasts of sessions from TieCON East will be made available through Podtech. Here is the link to TiECON East Podcasts. Three podcasts are already available from TiECON East. Here is the link to TieCON East Web Page. Podcasts from TieCON 2006 Santa Clara are also available at podtech. "it is a solid market. If you know how to decode it, an entrepreneur can capitalize on a growing demand for web based services and products. Ideas which looked unrealistic 5 years back are looking great today." Internet has reached a considerable critical mass ofÂ users for any web based business to take on. With the advent of broadband connections, users can download bandwidth intensive data and applications like video. Too many people are using internet and the number is growing crazy. This will introduce unexpected security issues. Almost all internet users are interesting in some kind of social networking. Extensive use of Multi media products like photos, music, video. Rajat's DreamOn blog : Post here. 27 graduates out of the 35-student electrical engineering batch at IIT Mumbai have opted for jobs with start-ups rather than top-tier companies. In the past, if IITians are any good, so far they only got a better job. Nothing more to celebrate. Now if these new generation IITians are any good, we will see some great new cool products on the horizon. Little test to the hype of inflated merit of the IITians. They did not follow the blind alley of fetching a job at a multinational and showing their mettle that they are different and they want to be distinct. If you count the number of startups and successful ventures so far, startups with IITians are not on far with the media hype. Its is the graduates from other colleges who started venturing into entrepreneursip before IITians pissed off at big companies and started thinking about starting their own.Â I hope atleast this would help to shift the media attention to brave and innovative startups, which they surely deserve. I do not think that because IITians are joining startups, miracles will happen. Remember, IITians are following the paths of graudates from other colleges, who have ventured the path with conviction and ambition in the first place. Media attention is a bonus for the startup though. And I hope they have some creative minds that India can finally get the benefit of. Over the last 4 months, I have visited many selected blogs ( I didn't keep a count, but based on my notes,Â around 150) particularly looking for information and discussion at length on various topics about Startups. I have been looking more precisely for software or technology startups. Not many are there dedicated to Software Startups, but very much wandering about all kinds of businesses; someone said it best "wandering generality than a meaningful specific". Most of them never have or had any kind of startup experience. Some of them are though, self employed or independent consultants; other than that they never started or operated any kind of business that is bigger than a 1 man operation. Most of the discussions are on 'good to have' or 'good to do things'. And interestingly larger portion of posts are, 'hey this is the wayÂ I think one should start up a business or market or do some thing about a startup. What do you think?'. They almost all participate in affiliate marketing, means they promoteÂ books and products on thier posts at every opportunity they get, without ever offering any justification or their own experience of benefits about the product. Some times, the posts are so obviously written just to promote a book or a product. Not many blogs discuss any issue in depth. The content and discussion is always just scratching the surface. May be they do not have real world experience of a startup company, so I can not expect any deeper understanding than just nice to have 'common' stuff. I can not say, I haven't learnt anything from them, but I bet there is nothing new or indigenous on many posts. Very few have real world experience. And very few talked about, hey this is what we did, this is how we faced the problems and this is how we achieved the success.Â I wish to spend some time sharing about these few gems, along with stereotypes. I wish to share the reasons why I think some may be just a waste of time going through. My first posting on the Cool Blogs section will be about the blog that promises to offer Practical advice to Software Startups. It has kept its promise beyond my expectations and worth every second I spent at this blog. http://www.OnStartups.com. A very thought provoking post with questions that offers a fresh perspective about the product a startup is offering, posted in a ingenious conversation format. http://www.onstartups.com :Â Why your software is not selling? Lack of visibility:Â Nobody knows who you are. Lack of leads:Â Not enough people you can convert to customers. Value Unclear:Â Prospects canâ€™t figure out what it is you actually do for them. Value Clear, But Not Compelling:Â Prospects know what you do, but couldnâ€™t care less. Trials Too Difficult:Â Youâ€™ve made it too hard for prospects to try your product â€“ and few will buy without trying. Competing On Price:Â Startups need to differentiate, but on something other than price.Â Youâ€™re trying to compete on price. No Credibility:Â Prospects have no reason to believe you will be around in 6 months. Too Hard To Buy:Â Youâ€™ve somehow managed to convince a prospect to buy, but the buying process itself is too difficult. Client Risk Greater Than Zero:Â Your customers are having to absorb some level of risk (e.g. :Â You donâ€™t have a money-back guarantee, you have long-term contracts, etc.). As reported at ZDNet news,Â the Senate Commerce Committee released a revised version of the Telecommunications bill that includes no Net Neutrality Regulations. There may be a revision to include Net Neutrality later in the week. As it stands today, FCC will be authorized, ONLY to monitor and report incidents that are considered as violations of Net Neutrality principles. The committee might put the final version of the bill on 20th of June. So, probably we won't hear much about it until later of the week, where a revision that include Net Neutrality is available, if any. Mean time, Washington Post in its editorial revealed itself to the public that its Broadband network means a lot more than the principles behind the whole Net Neutrality battle. Read its twisted arguments revealed at 'Post Editors Get Slippery on the Facts'. How come they missed the whole point? The advocates of neutrality suggest, absurdly, that a non-neutral Internet would resemble cable TV: a medium through which only corporate content is delivered. ..... If one broadband provider slowed access to fringe bloggers, the blogosphere would rise up in protest -- and the provider would lose customers. As pointed out by the posting at http://www.savetheinternet.com, not many of us really have a choice to move around. I have stayed in 4 different neighbourhoods in the last 2 years within Texas. I never had a choice to choose my ISP, because there is only one sevice provider available. Even at my current location, we only have Verizon for phone and DSL and dish network for television. The net quality is so bad, that we almost complain every weekend. We have no choice, but to live with it.Â To add to it, now they have 1 or 2 year contracts making it difficult to switch even when a choice is available. The weakest aspect of the neutrality case is that the dangers it alleges are speculative. It seems unlikely that broadband providers will degrade Web services that people want and far more likely that they will use non-neutrality to charge for upgrading services that depend on fast and reliable delivery, such as streaming high-definition video or relaying data from heart monitors. We don't even know if this is already happening with my service provider. How can a common consumer detect that his traffic is differentiated?Â Read MULTIPLE PLAY: PRICING AND POLICY TRENDS published by OECD (Organisation for Economic Co-operation and Development), for some facts and statistics about already enforced Bit Caps around the world. And why would a body like OECD mentions the following if there is nothing happenning? Bit caps (data usage restrictions on broadband connections) could be used to provide an unfair competitive advantage for infrastructure operators, provided the services obtained from independent service providers count towards traffic limits but services from the network operator do not. Today, some operators block ports for security or marketing reasons. Others have left open the possibility of blocking outside services in the future as a way to increase security and control bandwidth usage. By blocking ports or Web sites, multiple play providers could potentially create a "walled garden" whereonly the operatorâ€™s own services would be available to subscribers. The real problem if Net Neutrality not as a Law is that normal subscribers would never realize that they are being subjected to differential treatment. They think that the website itself is loaded, so responding slowly, but never that their traffic is being gated. We need Net Neutrality essentially as a legal assurance that common consumer will not be exploited and to safeguard the free market, where consumer will have final choice and freedom to choose what he/she wants. News link : Motorola has announced plans for an Indian manufacturing facility with an initial investment of US$30 million. This will be scaled up to a total of US$100 million in phases. The company will establish a manufacturing plant in the 300 acre Sriperumbadur Hi-tech Special Economic Zone (SEZ) being developed jointly by Motorola and Government of Tamilnadu at Sriperumbudur, near Chennai. On "Digital Maoism: The Hazards of the New Online Collectivism"
Very thought provoking and revealing essay. To my amazement, the collective knowledge is a trap. First, due to lack of authenticity, personality and authority over the content that is being written at Wiki. Second, most of the content written in wiki is compiled from other sources, mostly available on the web itself, by a person who may not have any authority on the content, what so ever.Â Another problem is with the search engines' logic to put wiki first than the original document in the search results, because they also follow 'popular' link route than 'original' link route. Factual statements and reporting is okay, but when it is about an opinion, position or an argument, such an expression is completely faceless. Here is a graphic lists out Green cards issued between 2003 and 2005. Mexico leads the table followed by India and China in that order. The report has lots of interesting statistics that might interest you. I understand each country has some kind of quota allocated for Green cards. If these statistics speak for any thing, then India got around 7.5% allocations in the quota. In 2005, a total of 1,122,373 persons became LPRs ofÂ the United States (see Table 1). The majority (66 percent) lived in the United States when they became LPRs. Nearly three-fifths (58 percent) were granted permanent residence based on a family relationship with a U.S. citizen or legal permanent resident of the United States. The leading countries of birth of LPRs were Mexico (14 percent), India (8 percent), and China (6 percent). The world isnâ€™t so much flat as gravely tilting, â€œand may be on the way to some kind of self-destruction,â€ believes Clyde Prestowitz, Jr. Weâ€™re due for a major rebalancing of global economic might, which the U.S. may well experience as catastrophic change. There are historic cycles, he tells us. As recently as 1850, China was the worldâ€™s largest economy, but by 1950, the U.S. and Europe had come to dominate the scene. Once again â€œthe hinge of history is taking a big turn.â€ China and India are fast overtaking Western nations in economic growth, driven by the digital revolution: â€œHalf the world has come onto the capitalist road â€¦at the moment when the road becomes a freeway,â€ says Prestowitz. The implications are staggering. While millions may rise from poverty, the possibility that these new economies develop along the lines of the American consumer model means increased competition for global natural resources, such as water and oil, and a drastic rise in global warming. In the meantime, says Prestowitz, Americans â€œare having a party.â€ This nation is the worldâ€™s only net consumer, while everyone else is a net seller. We assume the dollar holds universal sway, since all international commodities, from coffee to airplanes to semiconductors, are priced in dollars. So we run huge trade deficits, and live above our means, while we â€œoutsource the management of the value of the dollar to Asia.â€ This is unsustainable, Prestowitz warns. The central banks of China and Japan, which each hold a trillion dollars, â€œhave become increasingly nervousâ€ about the value of the money the U.S. prints, and may start to â€œdump dollarsâ€ in exchange for gold and other commodities. Prestowitz says the U.S. still has â€œthe best hand of cardsâ€ but is playing them as badly as possible. We must balance the federal budget deficit right away, through tax increases; prepare for a drastically devalued dollar; and strive for global agreements where Asian nations agree to spend more, and the U.S. agrees to save more. Happy with the last nights rejection of Net Neutrality in the House of Representatives, Telecom companies will soon be giving a generous gift to its consumers, called 'Bit caps'. They have promised themselves to give this gift to their consumers now or little later but definitely. This time, they mean it. People, that rejected the Net Neutrality, do you know what is in the making and what can be expected from these greedy Telcos? Here you go.One tiny step. Bit caps. If you are following Net Neutrality debate, you must have heard that Telcom companies said there is no discrimination at this point. And so we don't need a law to prevent something that does not happen. Read the report "MULTIPLE PLAY: PRICING AND POLICY TRENDS"Â published by OECD (Organisation for Economic Co-operation and Development). There is some thing called 'Bit caps' mentioned in the document that is already in force in many countries. 15.4 MB per minute of television viewing. A subscriber with a 2 GB bit cap would run over their monthly allotment in only 129 minutes of television viewing from a competitive provider. Folks, who rejected the Net Neutrality bill, do you understand what is in the making?